Syringa is a genus of about 20 species of deciduous shrubs and trees found in woodland and scrub from Europe to Asia. 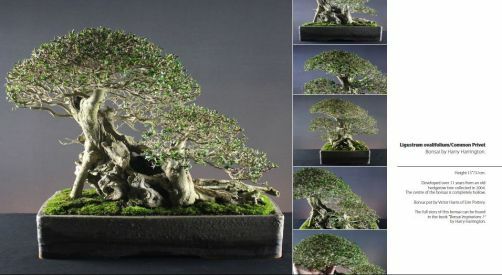 Not ideal as bonsai unless thick trunks or stumps can be obtained as leaves and flowers tend to be on the large size. Lilacs are primarily grown as bonsai for their panicles of small, tubular, usually very fragrant flowers which are usually in shades of white, blue, pink or purple. Most garden varieties of Lilac are grouped under the name Syringa vulgaris.They are very tolerant of hard pruning necessary for bonsai cultivation; there are however some Syringa species that will only tolerate very light pruning, are unsuitable for root-pruning and should be avoided. S. vulgaris is a spreading shrub or small tree to 7metres, that with age develops deeply furrowed bark. Leaves are heart-shaped to ovate to 20cm long . Very fragrant, single or double flowers are produced in dense, conical panicles to 10-20cm long in late Spring and early Summer. There are a great number of varieties available that carry differing flower colours. FEEDING Every two weeks throughout the growing season. REPOTTING Every two to three years as buds extend, keep relatively pot bound to reduce leaf-size. PRUNING Prune back hard in late-Winter and then allow to grow until after flowering. Pruning during this time will remove flowers/ flower buds. After flowering prune to shape and continue to prune for the rest of the season. PROPAGATION Sow seed outside as soon as ripe or in Spring. Take greenwood cuttings in early summer. Air-layer in early Summer. STYLING Informal and slanting forms with single or multiple trunks. In a size large enough for individual variety leaf and flower size.